There exists, in northern Tanzania, a lake of fire. Formed more than a million years ago by the restless movement of tectonic plates under Africa’s Great Rift Valley, it lies in the shadow of the active volcano, Ol Doinyo Lengai. This is Lake Natron, a shallow saline body of water that burns with alkalinity born of the volcano’s unique soda ash that has rained into its waters over the last 350,000 years. Almost as alkaline as ammonia, and as scalding as a cup of coffee, the waters of Lake Natron will blister skin, burn nostrils, blind eyes, and poison nearly any animal tempted to drink its water. As caustic as it is, there is one resource the lake does offer– soda ash. Soda ash, (sodium carbonate or Na2CO3), is a key raw material essential to the production of many household and industrial products. Most soda ash is used in the manufacture of glass, allowing silica to melt at a lower furnace temperature, thus saving energy and costs. 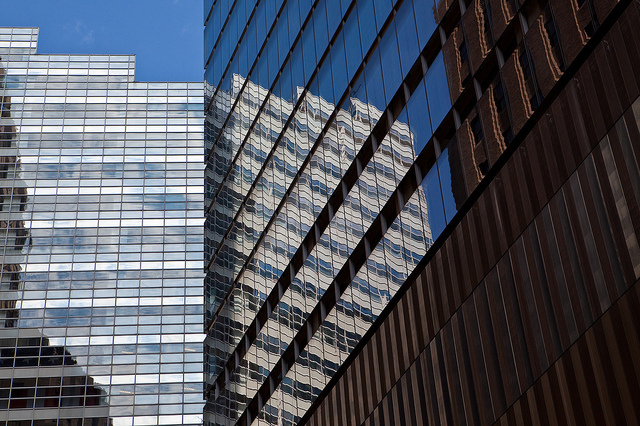 Worldwide, glass production amounts to more than half of the total end-use for the chemical. Most of this goes to “flat glass” used for automobiles and in construction as well as mirrors, solar panels, and signs. Beverage bottles account for a lion’s share of the remainder of the glass market. In addition, soda ash is used in the production of soaps and detergents and provides chemical co-products such as salt, borax, sodium bicarbonate, and sodium sulfite. In total, the world demand for soda ash is estimated to be around 52 million metric tons per year and is expected to grow to nearly 65 million metric tons by 2016. Soda ash is cheaper to mine than to make, so any country finding itself sitting on a deposit stands to have a viable market for the resource. And that’s what happened in Tanzania where a deposit of some 460 billion cubic litres of soda ash was discovered in the Lake Natron Basin. Growing at a rate of 4 million cubic litres per year, it’s a seemingly endless supply. With profits in mind, in 2007 the National Development Corporation of Tanzania (NDC) joined with Tata Chemicals under the name of Lake Natron Resources Limited (LNRL) to build a soda ash extraction and processing plant near Lake Natron. The projected $450 million plant would produce a half-million metric tons of soda ash per year with expectation to quickly double that capacity. All that was necessary was to complete an Environmental and Social Impact Assessment (ESIA). LNRL did that to the satisfaction of the Tanzanian government, but not well enough for another organization that was keeping a close eye on the project. Lake Natron, it turns out, is listed as a Ramsar Convention site. The Ramsar Convention is an intergovernmental treaty that provides the framework for the conservation and wise use of wetlands and their resources. That report, combined with pressure from dozens of environmental organizations and local citizens, did its job. 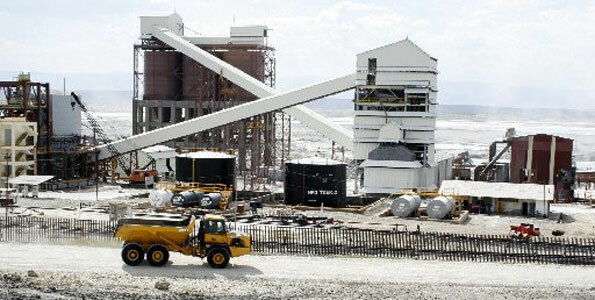 In June 2008 Tata pulled out of the project and issued a statement citing their commitment to environmental sustainability and stating they would not proceed with the Natron Project. So what’s the problem? With the promise of employing hundreds of people from across the region and bringing national prosperity, why would anyone protest a chemical plant to extract soda ash from “the most caustic body of water in the world”? 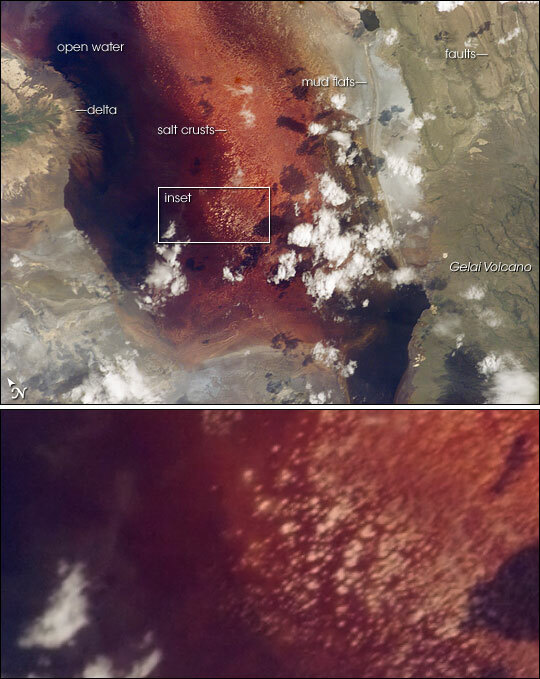 Despite Lake Natron’s noxious nature, there is one life form that flourishes in this caustic soup: cyanobacteria (blue-green algae), an extremophile microorganism that provides the lake with another fiery quality—its startling red color. While most cyanobacteria are blue-green, the species at Lake Natron, Arthrospira fusiformis, at type of Spirulina, contains red pigments. Spirulina thrives in salt, so during the hot dry season when water levels drop and salinity goes up, the lake blooms in glorious hues of crimson, pink, and orange. Even the miles of salt crust on the surface become pink with bacteria. But it’s not the cyanobacteria that have more than 50 international organizations up in arms over the soda ash plant. It’s what eats those cyanobacteria — another blazingly colorful creature whose survival hangs in the balance on this lake— flamingos. Lake Natron is the breeding ground for three quarters of Africa’s 2.5 million lesser flamingos (Phoenicopterus minor). Impervious to the burning water, they come en masse to Lake Natron to eat the rich Spirulina. The birds swish their “upside down” beaks back and forth through the water, siphoning it through special filters that allow them to capture the algae. 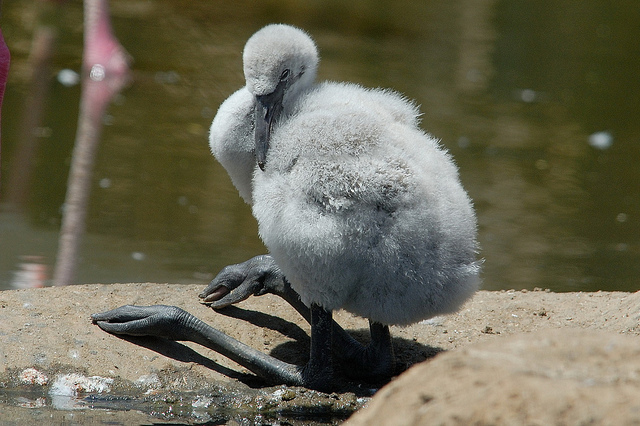 An adult lesser flamingo consumes up to about 72 grams dry weight (DW) of cyanobacteria per day and in return, the bacteria pass along their rosy pigment to the birds’ feathers. And it’s those rosy feathers that put the flamingos into the mood to breed. The courtship event is spectacular and loud, with up to two million blushing pink birds dancing, strutting, and marching in great coral swirls and eddies, much like the lake itself. Finally, after days of courtship, the flamingos choose their partners for the season and mating commences. At the same time, the lake is changing as well. As the dry season approaches, the water begins to evaporate causing a salty crust to form on the surface. Slowly these thin crusts grow thicker and merge, blown together by the desiccating winds to form a solid salt island extending miles into the lake. It’s these salt sheets that hold the soda ash so valuable to humans. 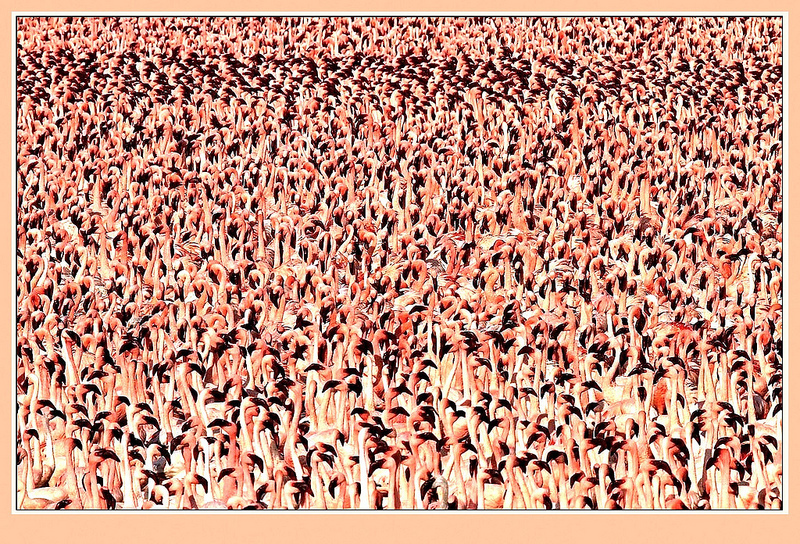 And it is the salt sheets that ensure the flamingos’ survival. On this burning crust the flamingos build their nests and raise their chicks, well-protected by miles of salt from land-based predators. After the chicks hatch, the parents fly back and forth bringing them beakfulls of rich Spirulina-laced water. Soon the young leave the nests and gather in large groups called a crèches. There they practice walking, growing strong on algae and readying themselves for a seemingly impossible march. Finally the day comes when they set off, each crèche following its guardian bird, an adult charged with leading them across miles of burning salt. Each night the chicks will rest with their parents, but it is up to the guardian birds to shepherd the youngsters safely across the flats. The march takes days. The unrelenting sun beats down. The temperature on the salt flats may reach 140F. Many chicks fall by the wayside, dehydrated, weak, or burdened by salt shackles that build up on their legs. But most make it, and eventually survivors converge into one huge group. Now thousands of tired but excited young birds pick up speed as they make their final approach to their oasis – the relatively cool body of the lake. With three quarters of the world’s lesser flamingo population relying on Lake Natron, the end of the lake could easily spell the demise of the species. Not only would it destroy the flamingos’ breeding ground, but it would also affect the salt marshes and freshwater wetlands bordering the lake. These support a variety of plants, birds, crustaceans, and surprisingly fish— three species of alkaline tilapias, thrive along the margins and inlets of the lake. One of those, Alcolapia alcalica, although not endemic to Lake Natron, is an endangered species. What they are saying is that the flamingos and their lake are more important to the economics of the region than a soda ash plant. The same study reported that public and local communities stood to gain between $1.28 and 1.57 billion over the next 50 years, if the Government of Tanzania invests in tourism, protection of the environment and promotion of local livelihood alternatives. 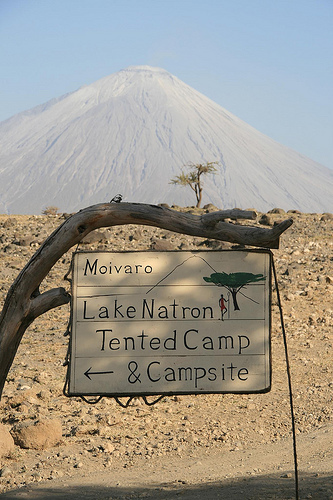 Located on Maasai land in the heart of the Rift Valley, the Lake Natron basin is still considered off the beaten path. However, the residents are working to change that and a budding tourism industry has emerged. In 2008, the RAM Report estimated that the southern Lake Natron region alone generated about US$ 500,000 per year in ecotourism, excluding associated spending. The still-pristine basin offers dramatic scenery, spectacular waterfalls, wildlife safaris, and fishing and hunting, all under the now-mandatory watchful eyes of paid local guides. For around $100US, a truly adventurous soul can even climb the active volcano Ol Doinyo Lengai, an effort that usually begins at midnight so as to arrive at the peak at sunrise and descend before the heat of the day settles in. In addition, craft-makers, restaurateurs, and other creative entrepreneurs are finding other ways to take advantage of the inflow of tourist dollars. And, of course, all of this is centered on the flamingos, those dancing crimson birds that bring film crews, photographers, eco-tourists, bird-watchers, and scientists to the shores of Lake Natron. Or, for instant gratification, but low-definition, watch it in full HERE. Either way, it is 100 minutes you won’t forget. Simply amazing, the interconnectedness of nature that brings such beauty, and that create natural resources that we use everyday. Kim, in your research did you discover whether there are groups that are actually trying to create soda ash, as opposed to mining it?